It was a solid night for most of the ThorSport Racing drivers. 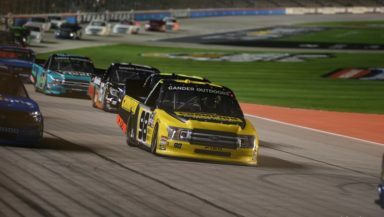 The finishing order saw Johnny Sauter, Grant Enfinger, and Matt Crafton all finish in the top five. Ben Rhodes finished 10th. Sauter started seventh and had a somewhat good truck. He finished ninth in Stage 1 but didn’t finish in the top-10 for Stage 2. He led once for seven laps after taking fuel only after Stage 2 to gain track position. Sauter was even in the close battle after the restart but fell to third. He was too far back to catch the race leaders or even challenge for the win, but it was still a good points night for the No. 13 Tenda Heal Ford, as he finished in third place. It was Sauter’s second top five of the season. For Crafton, it was a different story. He started 12th and finished fifth. There were some moments during the race where he found himself battling with Kyle Busch for the win after a great pit stop by his crew. Ultimately, Crafton came home winless and is still looking for the win.